Below you will find woodcuts of citterns taken from treatises and music publications from the Renaissance. This is one of the first woodcuts we have of a cittern. It is taken from Adrian Le Roy's Breve et facile instruction of 1565. This is a fine example of the French style cittern, with 4 courses, diatonic fretting, and the "Kithara" scrolls common to many of this style cittern. This same woodcut was also employed by Phalese and Bellere in their Hortulus Cytharae of 1570 and 1582. This woodcut of a 4-course cittern is taken from Thomas Robinson's New Citharen Lessons of 1609. 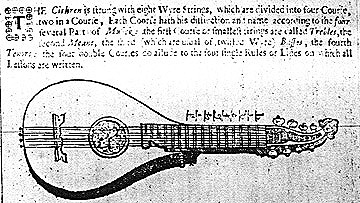 Though similar to the Le Roy's cittern above, differences to note are the use of 3 strings to a course on the second(!) course, and the change in fretting from diatonic to chromatic. Robinson's cittern was probably not too different from the one depicted by Praetorious, below. This is a picture of a chromatic 4-course cittern ("Klein Englisch Zitterlein") from Michael Praetorious' Syntagmatis Musici. This cittern is much smaller than the "standard" cittern of about 43cm, and it is believed to be of the type that was most commonly played in England and for which much of the English repetoire (such as Anthony Holborne's Cittharn Schoole ) exists. 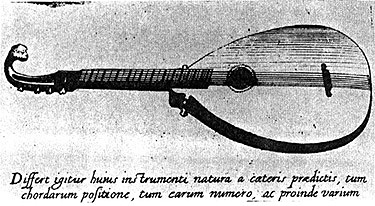 This is a picture of a rather strange looking cittern from English philosopher Robert Fludd's Utriusque Cosmi ... Historia vol. 2 (publ. 1618). It appears to have 4 courses of 2 strings each. While exhibiting the traits common to many surviving pictures of citterns, this one is somewhat unusual in its large body and very thin neck. Perhaps this is more of a rendering than an attempt to capture something real? Click here for some observations about the Fludd cittern. By the late 17th century the cittern was experiencing a massive decline in popularity, despite the attempts of people such as John Playford, from whose Musicke's Delight on the Cithren of 1666 this woodcut is taken. Sadly, Playford's attempts at reviving the cittern through publishing may have hindered rather than helped the cittern's popularity due to the poor quality of his editions, both in quality music and lack of mistakes! 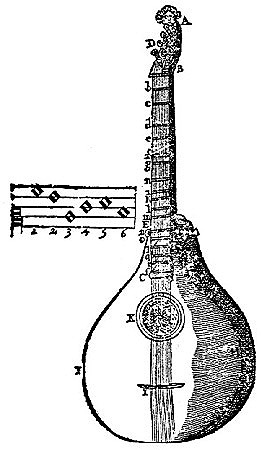 But even as late as 1666, one can see that the 4-course cittern had changed very little (at least in outward appearance) from Le Roy's cittern of 1565. This is a cittern from Kircher's Musurgia Universalis of 1650. This is one of the few pictorial sources known, and possibly the only woodcut, depicting a 5-course cittern. What is interesting about this woodcut is that it shows a compromise between the many different features found on citterns. As a carry-over from the French citterns, this one has diatonic fretting, lateral pegs and a curved outline. It is lacking though in the "Kithara" scrolls, while exhibiting an update in playability through its expanded range by the addition of the 5th course. Here is one example of a 6-course cittern, complete with tuning diagram. Things to note about this cittern are the sagitall pegs, curved outline, "Kithara" scrolls, and what seems to be diatonic fretting (note the large space between frets 'c' and 'd'). More interesting than the cittern itself, perhaps, is the tuning diagram. The tuning shown here gives the tuning from Lanfranco's Scintille di Musica of 1533, but the specific pitches are not what the cittern player is accustomed to: this diagram shows a top pitch of 'a' rather than the 'e' that other Renaissance sources and modern musicologists tell us was used. Either way, the basic intervals are the same, and this cittern - while having 6 courses - had no greater a range than its 4-course counterparts, only the addition of two notes to complete the hexachord. This is another picture from Praetorious. This depicts an "older style" 6-course cittern. Like the woodcut from Kircher, this cittern also has the typically Italian sagitall pegs; yet note here, unlike Kircher's, this cittern has straight shoulders and lacks the "Kithara" scrolls. This picture represents the cittern player's answer to the theorbo - a 12-course cittern! Praetorious calls this the "Dominici Zwolff Chorichte Cither" after the person (Dominici) who supposedly played it. Here is the Renaissance at its finest: the sound of wire with the versatility of a plucked continuo instrument. But it should be noted that even lutes were sometimes strung with metal strings rather than gut! 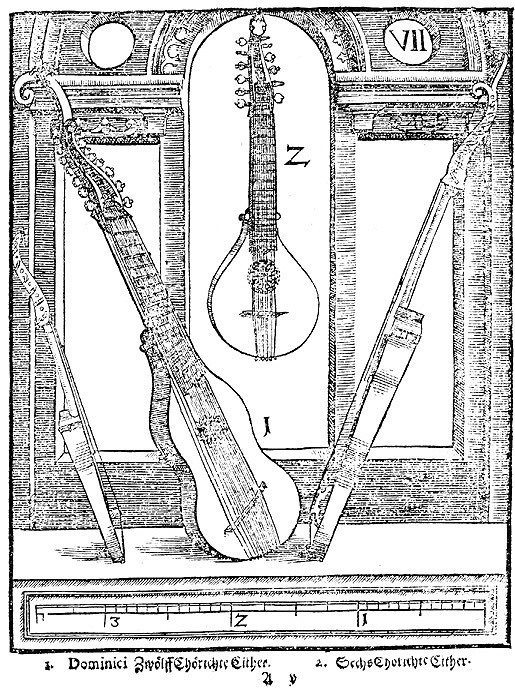 Possibly the ultimate in the arch-cittern family, Thomas Robinson boasted of a 14-course cittern ("which invention was first begun by an Italian in Italy, but altered, and strings augmented by me.") in his 1609 publication, for which he wrote several pieces. Different in shape from the Dominici cittern, Robinson's 14-course behemoth retains the cittern's standard shape ("scrolls" and all) and simply extends the range by widening the neck and adding bass strings. While one might assume that this cittern was of a large size, Peter Forrester has kindly pointed out that the left-hand stretches required in the music indicate the instrument was more likely of the standard size (circa 43 cm mensur).